Toronto Wolfpack in action at Halifax. Featherstone’s Dave Downs is playing a part in helping Toronto Wolfpack in their bid to make it into Super League. Downs, who locally is also Featherstone Lions’ coach co-ordinator, has been working with the Wolfpack as a specialist wrestle coach. As someone who can count Featherstone Rovers, Castleford Tigers, St Helens, Wakefield Trinity and Salford among the clubs he has coached, Dave was invited to pass on his valuable experience when Toronto director of rugby Brian Noble was setting up his staff at the Canadian club. Dave explained his role with the Wolfpack and how it came about that he was taken on by them. He told the Express: “I used to be strength and conditioning coach for a lot of years at Featherstone and I’ve worked at St Helens, Cas, Wakefield and Salford. “I’ve worked in professional rugby for a lot of years and I’ve worked at a high level. “Mainly what I do now is specialise in what is called wrestle, but I call it contact techniques. “I’ve been doing it for a lot of years and get asked to go to a lot of clubs, I help a lot of amateur clubs as well. “That’s what I do with Toronto at the minute, I’m the wrestle coach. “I do a lot of it over here pre-season then I do once a week in the season. “Players are obviously carrying bumps and bruises so we take the intensity out of it and learn technique stuff on certain days when they have been bashed about a bit. It’s a lot of technique stuff. 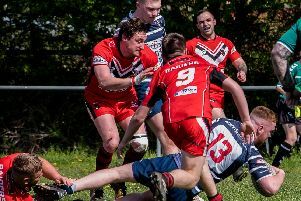 Downs’ amateur club Featherstone Lions could be linking up in some capacity with Toronto as the Championship club’s owner has been impressed with the community developments going on at The Millpond. Dave explained: “There’s a link with Toronto because David Argyle, the owner, is massively into community and has shown an interest in getting involved in what we’re doing as well. “He has been impressed with what’s going on off the field with the Lions and how we have plans to involve the local community. “The rugby side is massively important, of course, as well because if they are successful it’s footfall at the club. That footfall spends money and it creates money, which creates better kit, pays for buses and insurances and that kind of thing. “All the committee are fully supportive and the parents have been absolutely fantastic. Long may it last. “We are even raising money for a big play area that’s fenced in and safe so siblings can play there while parents are keeping an eye as well on their other kids playing rugby. “Parents are raising the money and that will leave a legacy.